Prostate cancer is the most common cancer effecting men in Western society and is the second highest contributor to cancer-related deaths world-wide . Despite such vast prevalence little is known about the etiology of prostate cancer. To date, there are three well-defined risk factors, which include increased age, ethnicity and a family history of the disease ; evidence for the latter supporting a genetic contribution to prostate cancer risk. More recently, inflammation has been implicated in prostate cancer pathogenesis . Different forms of prostate specific inflammation, including chronic prostatitis and proliferative inflammatory atrophy (PIA) have been frequently associated with the development of prostate cancer [4, 5]. As an understanding of the role of inflammation in the etiology of prostate cancer begins to emerge, an imbalance in cytokine production is thought to contribute to chronic inflammation and a failed tumor immune response. Suggestions that these specific inflammatory mediated conditions may in fact be pre-cursor lesions to prostate cancer development have prompted numerous investigations into identifying inflammatory gene variants that might predispose individuals to prostate cancer risk. (reviewed in ). A 480 kilo base (kb) block of linkage disequilibrium (LD) at chromosomal position 4q27 (Figure 1), harbors two cytokine genes, Interleukin (IL)-2 and IL-21. These genes encode proteins involved in numerous immune functions such as the activation and proliferation of immune cells including B-, T- and natural killer (NK) cells. IL-2, which is produced primarily by activated CD4+ effector T-cells, is a member of the common γ-chain cytokine family and appears to have pleiotropic effects in the immune system, acting as both a pro- and anti-inflammatory regulator . Similarly, IL-2 has been described as contributing to both pro- and anti-tumor immunity. In models of melanoma and renal cell carcinoma, administration of a high dose IL-2 based immunotherapy correlates with an elevated T regulatory (Treg) cell response associated with down regulation of tumor specific immunity . Alternatively lower doses of IL-2 for treatment of common malignancies including prostate cancer contributes to an anti-tumor immune response via activation of tumor specific NK cells [9–11]. A balanced IL-2 cytokine production in the prostate microenvironment may thus contribute to prostate cancer susceptibility. To date, a single prostate cancer association study has investigated genetic variants within IL-2 for prostate cancer risk and revealed a significant contribution of a synonymous IL-2 exon 1 variant (rs2069763) to disease susceptibility . Pairwise LD for gene variants located within approximately 480 kb at chromosomal position 4q27. The 4q27 region harbors cytokine coding genes IL-2 and IL-21, testis nuclear RNA-binding protein coding gene TENR and a gene coding for a protein of unknown function, KIAA1109. The seven selected SNPs (indicated by rs numbers) in this study display tight linkage across the region. The reference genome assembly used to determine physical SNP position was NCBI Build version 36.3. IL-21 is the most recently described member of the common γ-chain cytokine family. Similarly to IL-2, IL-21 is expressed by activated CD4+ T-cells and has been described as having anti-tumor effects in mouse models for several different malignancies, including prostate cancer . Experimental models have demonstrated the anti-tumor potential of IL-21, via expansion of tumor specific CD8+ effector T cells and suppression of anti-inflammatory Treg cells . IL-21 is involved in T-helper type 17 (Th17) effector cell function , which has been implicated in prostate cancer development  and more recently with progression to metastasis . No studies have to date investigated the potential role of IL21 variation in prostate cancer susceptibility. In addition to IL-2 and IL-21, the 480 kb region at 4q27 encompasses genes encoding testis nuclear RNA-binding protein (TENR) and a protein of unknown function, KIAA1109. The chromosomal region at position 4q27 has been highlighted as a potential risk locus in genome-wide association studies (GWAS) and candidate gene studies for several common inflammatory disorders including celiac disease, type 1 diabetes, rheumatoid arthritis, systemic lupus erythematosus (SLE), psoriasis, multiple sclerosis and both forms of inflammatory bowel disease (IBD), ulcerative colitis and Chron's disease [18–24]. Although replication studies have confirmed 4q27 as a risk locus for inflammatory disorders [22, 24–29], tight linkage disequilibrium (LD), essentially responsible for identification of the 4q27 region as a prostate cancer risk locus, in turn limits identification of the true casual variant. The proposed link between the 4q27 locus and autoimmune disease susceptibility is suggestive of a functional role for this region in maintaining a balanced immune response. Under the proposed hypothesis that chronic inflammation may mediate prostate cancer development, further supported by casual observations of tentative association between the incidence of prostate cancer and several common immune disorders including ulcerative colitis , rheumatoid arthritis , Crohn disease  and asthma , we investigate a potential role for the 4q27 region in prostate cancer susceptibility. Six autoimmune associated variants and a single functional variant were genotyped using a large Australian-based case-control study of prostate cancer. The Risk Factors for Prostate Cancer (RFPC) study is a population-based case-control study of 825 cases and 734 controls from the Melbourne and Perth metropolitan areas of Australia, and defined in Additional file 1. The men of predominantly European descent (including 9 cases and 13 controls of Asian origin) were recruited between 1994 and 1998 and described in detail elsewhere . Eligible cases were diagnosed with histopathologically confirmed prostate cancer via the State Cancer Registries and included irrespective of familial status. Cases were diagnosed before age 70 years with a Gleason Score >4. Tumor stage (stage I to IV) and grade (moderate: Gleason 5-7; high: Gleason 8-10) were obtained from histopathological reports. Controls were randomly selected from the State Electoral Rolls and frequency matched to the expected age distribution of cases. Information including age, family history of prostate cancer (in first-degree relatives), country of birth, and lifestyle were recorded during a face-to-face interview. Ethics approval for this study was obtained from The Cancer Council Victoria Human Research Ethics Committee, Australia (HREC0808). Seven single nucleotide variants across the 4q27 locus were selected for analysis with prostate cancer risk. Six (rs13151961, rs13119723, rs17388568, rs3136534, rs6822844 and rs6840978) were chosen due to highly significant associations reported in previous studies for autoimmune disease susceptibility. These associations may reflect an as yet unknown biological effect of these variants. The IL-2 promoter variant (rs2069762) was specifically selected based on previous functional reports [35, 36]. The six variants rs13151961, rs13119723, rs17388568, rs3136534, rs6822844 and rs6840978 were genotyped using Applied Biosystem 7900HT TaqMan allelic discrimination method, with an average 11.5% random study replication. 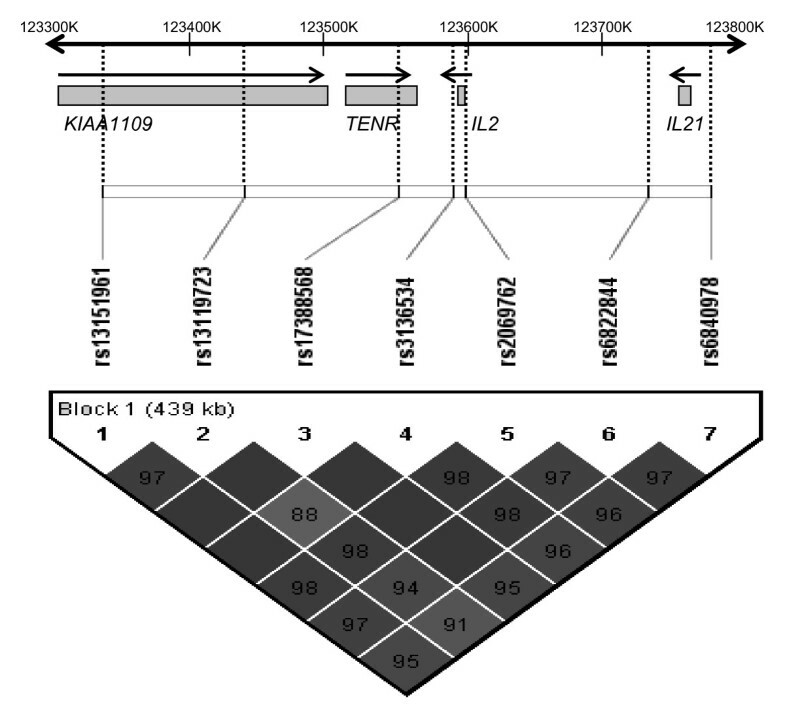 The IL-2 promoter variant rs2069762, was genotyped on two platforms using the Sequenom MassArray using homogenous MassExtend (hME) and TaqMan allelic discrimination methods. Study replication was performed for the purpose of platform and chemistry assessment and quantification, as previously published . Allele frequency estimates and tests of deviation from Hardy-Weinberg equilibrium (HWE) were carried out using standard procedures based on asymptotic likelihood theory . Unconditional logistic regression analysis was used to test for independence between the variants and age (<55, 55-59, >60), country of birth (Australia, others) and family history of prostate cancer (affected first-degree relative and two or more first degree relatives affected). Case-control analyses were conducted using unconditional logistic regression and OR estimates and their 95% confidence intervals (CI) were derived under likelihood theory. We fitted dominant, recessive, co-dominant, and per allele models. Heterogeneity in the odds ratios by age and family history of prostate cancer in first-degree relatives (0 or at least one) was tested by including an interaction term in the logistic model. One polytomous logistic regression model was used to estimate odds ratios (OR) for stage I-II and stage III-IV tumors and another to estimate ORs for moderate-grade and high-grade tumors. In order to test for heterogeneity in the ORs by tumor stage or grade, the likelihood from these models was compared with that from polytomous logistic regression models with ORs constrained not to vary by tumour stage or grade. All statistical analyses were performed using Stata 10 (Stata Corporation). All tests were two-sided and a 5% level was used as the threshold for statistical significance. Genotype calls were achieved for more than 99% of the study samples, with a 100% genotyping replication concordance using TaqMan allelic discrimination. Genotype distributions were consistent with HWE for cases and controls as well as cases and controls combined (all P > 0.19). No significant association was observed between genotypes and tumor stage or grade, age of prostate cancer diagnosis, prostate-specific antigen (PSA) levels, or country of birth for any of the variants we assessed in this study. Overall we found no significant association between the seven variants and prostate cancer risk (Additional file 2). The per-allele ORs ranged from 0.92 (95% C.I. = 0.79-1.07) to 1.16 (95% C.I. = 1.00-1.35) and they were all not significantly different from 1 (P = 0.06). The ORs were virtually unchanged after excluding the 22 men that were born in Asia. For rs3136534, the dominant model showed marginal evidence of association with risk: the OR for carriers of the rare allele versus carriers of two copies of the common allele was 1.23 (95% C.I. = 1.00-1.50, P-value = 0.046). Analysis by tumor stage, grade and age did not show any significant association. Analysis by family history of prostate cancer (Additional file 3) however showed evidence that the G allele for the intronic KIAA1109 variant rs13119723, was significantly more frequent in men with a family history compared to those with no family history (P-value for interaction = 0.02). The per allele OR associated with this variant was significantly higher than 1 (2.37; 95% C.I. = 1.01-5.57) for men with a family history of prostate cancer. Previous studies have reported a strong degree of LD within the 4q27 gene locus. Our results similarly support a high degree of linkage within this region (Figure 1). Results using the RFPCS suggest that genetic variation at chromosomal region 4q27 is not associated with overall prostate cancer risk. At 0.05 level of significance under a dominant model the sample size of our study allows to detect with 80% power a minimum OR of 1.33 for the most common SNP (rs2069762) and 1.36 for the least common SNP (rs13151961). The corresponding minimum detectable ORs under a recessive model are 1.54 and 2.11. Analysis of men with a family history of the disease, however, indicates that this region may be a risk locus for familial prostate cancer. The potential role of chronic inflammation in prostate cancer development, together with an observed association between the 4q27 region and susceptibility to autoimmune disease and in turn immune dysfunction, implicates the cytokine rich 4q27 region as a candidate prostate cancer risk locus. IL-2 and IL-21 are involved in regulating an immune response at multiple intervals, thus genetic variation likely to influence the function of these cytokines may have catastrophic effects to host immunity. Although IL-2 is well studied for association with autoimmune diseases, only a single study has investigated genetic association with risk for prostate cancer, implicating an indirect prostate cancer susceptibility marker , with no direct functional significance . In our study we elected to screen the promoter variant rs2069762, shown to influence IL-2 production up to 3-fold [35, 36] for a possible direct association. Although our results show no significant association for rs2069762, this is the first study to address the potential role of this variant in prostate cancer risk. The variant rs3136534 in the IL2 3' untranslated region (UTR) however, displayed a marginally significant association with risk for prostate cancer. The IL-21 gene is still considered a relatively newly discovered cytokine, and thus few disease association studies have been reported. Candidate gene studies have identified single variants (not observed on GWAS) within IL-21 to be associated with autoimmune diseases including SLE , type 1 diabetes  and atopic asthma . The latter study identified a synonymous exon 3 variant (rs4833837), also reported to correlate with serum levels of immunoglobulin (Ig)E and IL-21 . These results further implicate IL-21 in maintaining and regulating an immune response, although a high degree of LD within this gene region has hindered efforts to narrow the locus to its true causal variants. Despite suggestions that rs4833837 is associated with differential IL-21 activity, as yet no direct functional role for any IL-21 variant has been reported. In this study we selected variants that were most significantly associated with autoimmune disease susceptibility and are the first, to our knowledge to investigate variants within the IL-21 gene region for prostate cancer risk. A family history of prostate cancer has long been accepted as a major contributor to an increased risk of developing the disease . Identification of variants responsible for this inherent risk can be achieved by assessing variant frequency in cases with affected relatives. For the KIAA1109 rs13119723 variant, we found an increased OR for men with a family history of prostate cancer. This result reflects a different genotype distribution for both cases and controls with a family history compared with cases and controls with no family history. However, we cannot exclude the possibility that the increased OR may be due to chance and to the relatively small number of men with a family history of prostate cancer in our study. Although prostate cancer GWAS have thus far failed to implicate the 4q27 region as a candidate risk locus, the growing number of candidate gene regions already identified in these large-scale studies, highlights the complex and heterogeneous nature of prostate cancer. Thus, multiple, low to moderate risk alleles (not yet identified by GWAS) may still be implemented in the disease. It could therefore be argued that our pathway-linked gene approach to identify modest risk loci, in combination with large scale GWAS, may be appropriate to ensure complete coverage of potential prostate cancer risk factors. To establish whether the 4q27 cytokine rich region is a locus for familial prostate cancer risk as suggested in this study, the association needs to be replicated in independent studies that include a larger number of men with a family history of the disease. In addition to harboring a gene of as yet unknown function, few functionally relevant variants within this region have been elucidated. Hence, a more comprehensive analysis of potentially functional variants within 4q27 may provide a more accurate approach for analysis of prostate cancer susceptibility. We are grateful to the study participants, as well as the many urologists, nurses and histopathologists who kindly facilitated in the recruitment and collection of patient information and pathology reports. This study was supported by grants from the National Health and Medical Research Council (#396407, #504700, and #504702), Cancer Institute of New South Wales (VMH is a Fellow and EAT a PhD Scholar), and Australian Rotary Health Research (EAT is a PhD Scholar). Infrastructure support was provided from the Children's Cancer Institute Australia for Medical Research, the Cancer Council Victoria and from the Australian Cancer Research Foundation Unit for the Molecular Genetics of Cancer (located at the Garvan Institute for Medical Research, for Sequenom generated data). EAT participated in the design of the study, performed all genotyping and drafted the manuscript. The data contained within will contribute partial fulfillment of the requirements for the Degree of Doctor of Philosophy for EAT. MCS, DRE, JLH and GGG were responsible for collection and maintaining the epidemiological resource. HNH and GS performed statistical analysis and helped draft the manuscript. VMH facilitated the study design, analysis and drafted manuscript. All authors read and approved the final manuscript.